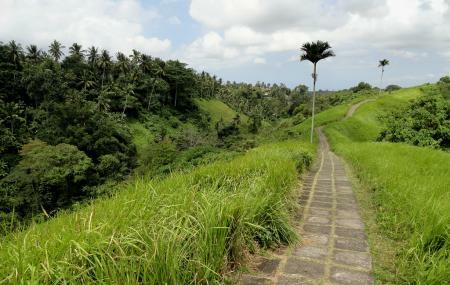 The Campuhan Ridge Walk is arguably the best known Ubud trek and with good reason. The sparse crowds and the aesthetically rich vistas remind one of why people from around the world come to Bali. The trail starts at the historical origin of Ubud, the confluence (or Campuhan) of the Wos Rivers. A long-walk in the evening is perfect way to spend time. Adventure sports and hiking activities are available. The hiking tour takes nearly more than 90 minutes. How popular is Campuhan Ridge Walk? People normally club together Pura Taman Saraswati and Kecak Fire And Trance Dance while planning their visit to Campuhan Ridge Walk. Beautiful scenery and great exercise trail. Busy with people, we went an hour before sunset so it was much cooler. Not too difficult, has ups and downs so if you aren't in shape it could be a bit of a challenge. Best to go when it's not too hot / sunny as there's not much shade. Just finished walking this trail, very pretty views & before sunset so it was cooler yet still that golden hour sunlight. Stone path the entire way but glad we had comfortable shoes. Bring a little bit of water. No bug bites. Took 30 minutes, free, definitely recommend! Such a Serene and beautiful walk! It's not a difficult one at all and go without any prep. Just take a water bottle and you'll find really good places around to pick up a coconut or a great juice. I was skeptical to do this one but the beautiful Ubud will let you enjoy the walk through out. Do it during sunrise or sunset. Beautiful walk, all kinds of fitness levels would enjoy. The walk seems to be a spot where locals and tourists get some exercise so you’ll find runners and some cyclists along the walk. However the views are beautiful , once you reach the end there are a few restaurants where you can enjoy , an ice cold Bintang or refreshment of your choice. Before sunset would be a good time to walk so that it’s not too hot but that you could view the sunset as well. Amazing hike between the green fields With amazing view. The path is easy and well prepared You don’t need any kind of guides, just go and enjoy. After around 2.5 km you will start seeing the rice fields and the farmers working there. The way back is the same path so you can walk as long as you can then go back or you can hire a taxi at the end. There is a lot of cafes in the way so you can buy water or any kind of refreshments. Make sure to have your water, hat, sunscreen.